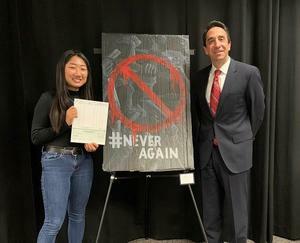 Prospect High School SeniorAileen Ra received this year’s annual “Justice for All” art award through the Santa Clara County District Attorney’s office on Monday, March 18. Ra took home $1,500 dollars for her acrylic painting titled “#NEVERAGAIN.” The portrait was made after the Parkland school shooting in Florida last year. Ra’s painting will be used as part of a county-wide campaign to raise awareness about gun violence. The Justice For All art contest is an annual event to raise awareness on topics of public safety. The focus of this year’s contest was “Post-Parkland: Students Speak Out Against School Shootings.